There’s nothing better to spice up parties, gatherings, events, or even just plain boring days, than music. However, you can’t liven up your events with your regular phone or television. You’ll need speakers; and good ones. With big parties and events, the crowd will definitely be all over your place, thus the need for a portable speaker with wheels. This is where the QFX Speaker comes to play; a portable speaker capable of playing music with a press of a remote. The QFX PBX-61081BT Speaker is a portable speaker that is designed like a suitcase, complete with wheels and a handle for better portability. TO maximize on the speaker’s portability, the unit is also rechargeable, allowing you to bring the speaker on the go, even without having to worry if there’s an electrical outlet nearby! This speaker allows music to be played from different sources such as your Bluetooth-enabled device, USB, SD card, or a cable connected to your device to the built-in aux-in port. Once you have a music source, you’re now ready to blast music through the speaker’s 8-inch woofer and amplifier. Put your favorite songs on repeat or place your playlist on shuffle without having to touch the speaker itself! If you’re using a Bluetooth-enabled device, you can simply use your music-playing application to play, pause, and choose your songs. Alternatively, the QFX PBX-61081BT Speaker comes with a remote control to allow you to control your music from a distance. While the QFX PBX-61081BT Speaker is great for playing music, it has other uses as well. This unit has a built-in microphone input, allowing you to plug in your microphone and make announcements or sing along with your favorite songs. If you’re looking for more than music, then you’ll be glad to know that the QFX PBX-61081BT Speaker also has access to your favorite FM stations for your entertainment fix. The speaker is available in three colors – blue, red, and white. The QFX PBX-61081BT Speaker stands out from other speakers because of its greatest asset: portability. It has stable wheels and an easy-to-grip handle that allows anyone to drag it around seamlessly. This makes repositioning the speaker so much easier than the regular speaker, more so because you can use it without having the speaker connected to a power outlet as it’s rechargeable. Pair this with your Bluetooth-enabled device or the remote control the unit comes with and you’ve got a completely portable speaker that allows you to move it from corner to corner without the hassle that comes with wires and weight. This makes the QFX PBX-61081BT Speaker perfect for most situations from children parties, to company get-togethers, to spring cleaning. One thing that the QFX PBX-61081BT Speaker lacks is water resistance. While it’s a small concern for regular parties where the only real threat to the speaker is careless people with water, this is easily combated by good positioning. However, for swimming get-togethers, this a bigger problem. The pool and beach are better when there’s great music booming in the background, but the QFX PBX-61081BT Speaker isn’t naturally water-resistant so that’s a little problem water lovers might experience. An easy workaround is to buy protective casing for the speaker, but that’ll require a few more dollars on top of the speaker’s price. Another work around is just placing the speaker in a place far from water, though placing it too far might make the music not loud enough. The most similar portable and rechargeable speaker in the market comparable to QFX PBX-61081BT Speaker is the Tyler Tailgate Portable Wireless Bluetooth Speaker PA System TWS404-BK. They share a lot of features yet still have a few differences that set them apart from one another. The two speakers allow playing music from Bluetooth-enabled devices, both are portable and rechargeable, and both have microphone inputs. The Tyler Tailgate speaker has a guitar jack input alongside its microphone input which allows for better sing along sessions. It also can function as a USB power bank for your smartphones or tablets. However, unlike the QFX speaker, it does not have access to FM radio and can only play music through Bluetooth-enabled devices, whereas the QFX speaker can play music from four different sources – Bluetooth-enabled devices, USB, SD card, and through an aux cable. Price-wise, the two are similar, but the QFX is cheaper by a few dollars. If appearances matters, the Tyler Tailgate speaker only comes in black while the QFX speaker comes in blue, red, and silver. The Tyler Tailgate speaker is better suited for musicians thanks to its guitar jack input, but the QFX Speaker is more suited to the general as it has the bases a good speaker covered. While not exactly in the same price range, the Sylvania Portable Bluetooth Speaker needs to be brought up as it is basically a watered-down version of the QFX PBX-61081BT Speaker. It has the basics covered such as being portable and rechargeable and allowing music to be played from any Bluetooth-enabled device and through an aux cord. However, it lacks all the extra features the QFX speaker has such as playing music through USB or SD card, having a microphone input, and having access to FM radio. The biggest deal breaker might be the Sylvania speaker’s portability because unlike the two aforementioned speakers, this speaker does not sport any wheels for better portability. The QFX PBX-61081BT Speaker is perfect for anyone looking for a portable speaker. 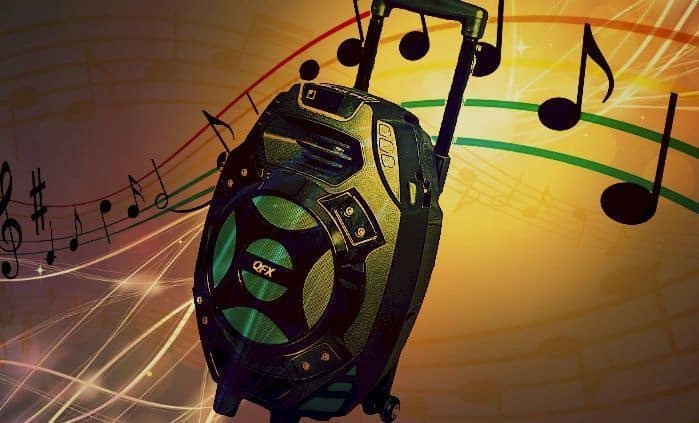 Whether you want to use it at home while mowing grass or bring it to your friend’s monthly get together, the QFX speaker delivers when it comes to playing music. It’s portable, rechargeable, and its size allows it to be brought practically everywhere without any wires tying it down. The QFX Speaker is a great rechargeable and portable speaker with wheels that generally fits in with someone’s speaker needs. Its great portability allows it to stand out in the market. It’s numerous music sources, microphone input, and FM radio makes it one of the best choices for someone who needs a loudspeaker that can be brought anywhere.